A totally different kind of break out than the previous post, you'll need one of this for a fast getaway! 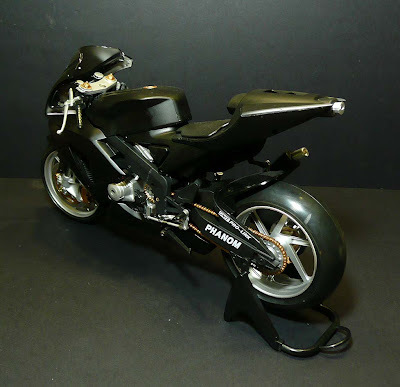 When I first saw this (link here), I was keen to get it for the bike and weapon. The price for this set turned out to be pretty affordable (about the same as a Soldier Story boxed figure set) which was why I got it. 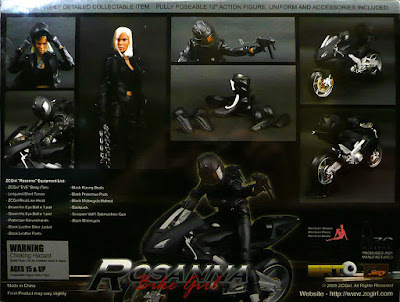 The packaging for ZC Rosanna Bike Girl is pretty straightforward - put her on the bike and ship the whole thing out! 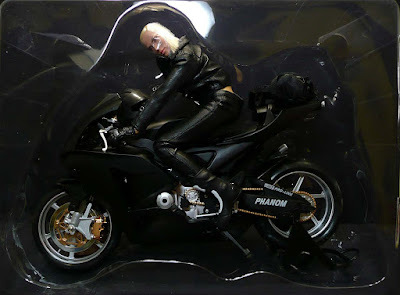 Items listed include: ZCGirl "EVE" Body with "Rosanna" head, brown iris eye balls and green iris eye balls, long and short torsos, necklace, gloved hands, black leather biker jacket and pants, black racing boots, protective pads, black backpack, black motorcycle helmet, Scorpion Vz61 Submachine Gun and Black Motorcycle. The items are hidden in her spare torso and black backpack, so don't chuck anything away before you've checked. 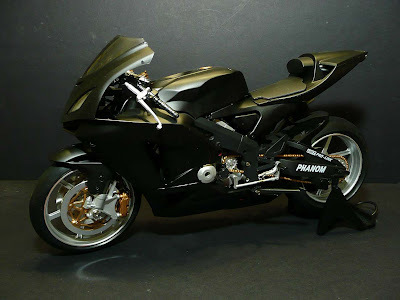 The bike is NICE and the fact that it doesn't cost an arm and a leg is GREAT! 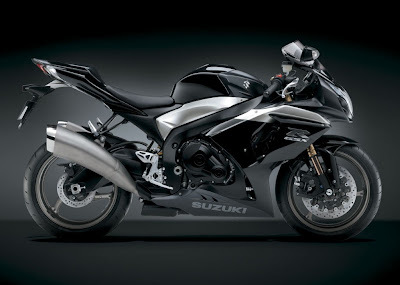 I don't know much about bikes so I googled and found a similar looking bike which is real - the Suzuki GSX-R1000 Phantom. I only did so because the bike has the word "Phanom" on it. I don't know if this is based on the same model. I only searched for it because of the word on the bike. More on "Rosanna" and her accessories in the next post (link here). Plus you gotta have Rosanna riding her bike (post here). Other Bikes in my collection: Batman rides Batpod, Kitbash Bruce Wayne Biker, GSG 9 "Ulrich" on bike, Metropolitan Police Officer riding his Harley Electra-Glide, California Highway Patrol (CHP) officer riding his Harley-Davidson FLH1200, Operation Desert Storm SAS Scud Hunter, Action Man Super Bike, Action Man Bike, World War II Indian Military Motorcycle, World War II Harley-Davidson WLA 45 Military Motorcycle, Kamen Rider the First with Cyclone, Darth Maul's Sith Speeder, Kamen Rider V3 on Hurricane, Kamen Rider 1 and Cyclone, Akira's Kaneda's futuristic bike, Light Cycles from "Tron" the movie and Ghost Rider on his Flame Cycle. 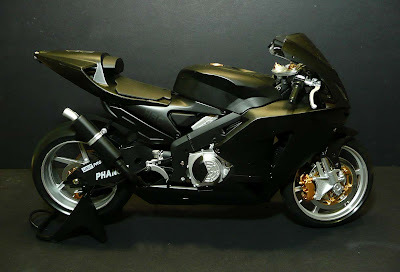 In fact, this motorbike is an Aprilia RSV Factory Dark Lion. Is the same motorbike that Megan(Hot! )Fox will use in Transformers 2!!!Awesome!! I got this figure just for the bike. Got a 13" Black Canary, so she obviously needed a ride. I know $100 bucks is a lot to pay just for the bike when it could've gotten for less and probably something nicer but the Rosanna figure isn't all that bad looking either contrary to what a lot of collectors seem to be saying out there. Plus you get some cool accessories to go with it. A winner in my book! Anon, thanks for the comment. 13" Black Canary riding this bike - Hmmm, you're giving me ideas. How's the articulation for the DC Direct figure? Can she hold the handle bars well? 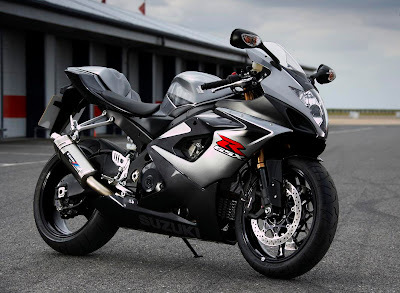 I am still thinking whether to buy the bike now...Headache!! 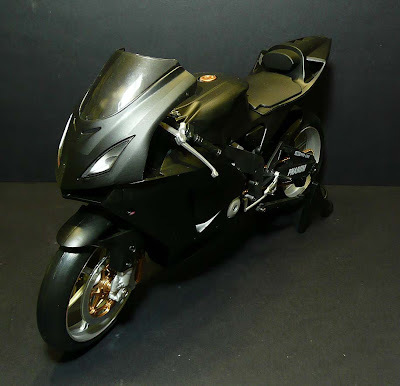 The bike is a Honda RC 211V this is a moto gp race bike. 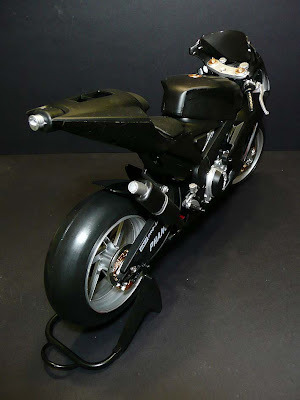 Look at the exhaust, tail, and lines of the bike. 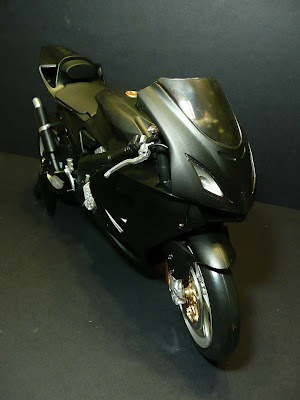 The 2003 2005 Honda cbr 1000 is the closest street legal bike with the same lines as an RC211V but only has the exhaust under the tail and not a lower exhaust. THANKS again, whoever you are!